The ISTO celebrates its 5th anniversary! Founded as the "Institute for Communication Economics" (ICE) chaired by Tobias Kretschmer as an endowed chair by the Deutsche Telekom Stiftung in autumn 2006, the ISTO can today look back on five exciting and successful years. To the winter term 2010/2011, the Institute has been restructured and the chair has been renamed "Institute for Strategy, Technology and Organization". 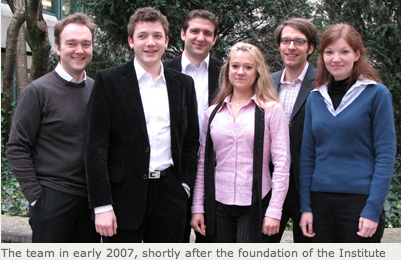 During its still young history, the Institute has established itself in research and teaching and has already brought forth four successful postgraduates: Jörg Claussen, Thorsten Grohsjean, Ferdinand Mahr and Mariana Stamm. The annual reports with an overview of the most important activites at the Institute during the last few years can be downloaded here. On behalf of the entire team, we would like to thank all our supporters and companions. We would particularly like to thank the Deutsche Telekom Stiftung for its constant support. We are looking forward to many more years working together!